This research is funded by the Leverhulme Trust and aims to explore the circumstances in which faster thinking is more logical than slower deliberative thinking, using the innovative methodology initially reported in Villejoubert (2009). It involves a series of six experimental studies designed to provide evidence that logical considerations do not always require a higher motivation to ‘think harder’, and that, contrary to accepted wisdom, increasing reliance on intuitive thinking or decreasing cognitive resources may in fact serve to improve judgments. This work has the potential to challenge dominant theoretical accounts and current educational strategies for teaching probabilistic reasoning. As a consequence of the complexity and inherent unpredictability of the world in which they live, humans naturally seek to understand and manage the uncertainty of present and future outcomes. Yet, reasoning under uncertainty exhibits a number of biases and shortcomings (e.g., Villejoubert & Mandel, 2002).The conjunction fallacy is a well-researched example of such suboptimal reasoning. Tversky and Kahneman (1983) illustrated this fallacy with the Linda task, which introduces ‘Linda’ as a single 31 year-old woman, outspoken and very bright, who majored in philosophy, is deeply concerned with issues of discrimination and social justice, and has participated in anti-nuclear demonstrations. After reading this short description, individuals tend to believe, against the tenets of logic, that a conjunction of two events (e.g., ‘Linda is a feminist and a bank teller’) is more likely to be true than one of the conjunctive events (e.g., ‘Linda is a bank teller’). It is commonly argued that such errors occur because people are not accustomed to engage in effortful and time-consuming analysis but, instead, are often satisfied by plausible judgements arising from rapid intuitive thinking (Kahneman, 2003). This accepted wisdom presupposes that inadequate judgements occur through lack of motivation or cognitive capacity for engaging in effortful thinking (e.g., Stanovich & West, 2000). However, a recently developed research methodology has produced evidence that challenges this predominant view (Villejoubert, 2009). This innovative experimental procedure permits the examination of the relative impact of heuristic and logical considerations on judgements. Instead of asking participants to make separate evaluations of the probability of a conjunct and the probability of a single event, this procedure asks them to judge whether statements comparing both type of probabilities are correct or incorrect. These statements vary in terms of their logicality (logical vs. illogical) and their compatibility with the representativeness heuristic (representative vs. unrepresentative). To illustrate, Figure 1 shows results for representative and logical statements (e.g., ‘the fact that Linda is a feminist is more likely than the fact that she is a feminist and a bank teller’) and representative but illogical ones (e.g., ‘the fact that Linda is a feminist and a bank-teller is more likely than the fact that she is a bank teller’). 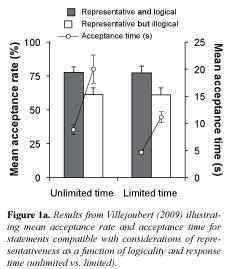 Participants in Villejoubert’s (2009) study were more likely to accept representative statements but they were also significantly less likely to accept illogical ones. Moreover, they consistently took longer before accepting a statement when heuristic and logical considerations were in conflict, even under time pressure (< 10s; see acceptance times for representative but illogical statements in Fig. 1). These findings highlight two important features of people’s reasoning: (1) the increase in acceptance time under conflicting situations suggests that people routinely engage in effortful processing and (2) the recurrence of this finding under time pressure suggests that the conflict between heuristic and logical considerations was easily detected. One possible account of these data would be that intuitive thinking might in fact point to the logical answer first. When this answer conflicts with representativeness, people then engage in effortful and deliberative thinking to resolve the conflict. This hypothesis goes against the traditional two-system theoretical account (e.g., Kahneman, 2003), which stipulates that under time pressure, thinking should be more heuristic and less rational. In contrast, Villejoubert’s (2009) findings suggest that quick thinking can be logical while effortful thinking can be biased by non-logical heuristics.The goal of this research project is therefore to explore more systematically the circumstances in which faster thinking is more logical than slower deliberative thinking, using the innovative methodology initially reported in Villejoubert (2009). De Neys, W. (2006). Dual processing in reasoning: Two systems but one reasoner. Psychological Science, 17, 428-433. Kahneman, D. (2003). A perspective on judgement and choice: Mapping bounded rationality. American Psychologist, 58, 697-720. Masicampo, E., & Baumeister, R. F. (2008). Toward a physiology of dual-process reasoning and judgement: Lemonade, willpower, and expensive rule-based analysis. Psychological Science, 19, 255-260. Stanovich, K. E., & West, R. F. (2000). Individual differences in reasoning: Implications for the rationality debate. Behavioral and Brain Sciences, 23, 645-726.
probability judgement. Psychological Review, 90, 293-315. (Eds. ), Proceedings of the 30th Annual Conference of the Cognitive Science Society (pp. 2980-2985). Villejoubert, G., & Mandel, D. R. (2002). The inverse fallacy: An account of deviations from Bayes’s theorem and the additivity principle. Memory & Cognition, 30, 171-178.